Discover this exciting and significant development in the world of sampled voice. The Giovani Edition was the first truly dedicated youth choir library determined to strike a chord with musicians ranging from the semi-pro to the most seasoned professional. Bela D Media has faithfully captured the glory of an authentic youth choir complete with 24-bit traditional church ambiance. The Giovani Edition sample library effortlessly produces a sincere, natural tonality alive with essential human characteristics. Enlisting the talents of a professional 32-piece youth choir, the Giovani Edition had achieved a sampling first by incorporating both ensemble and chamber sized vocal sections, finally enabling the correct composition of choral parts using a sample library. In addition, Bela D Media was the first to acknowledge and sample a complete girls choir. 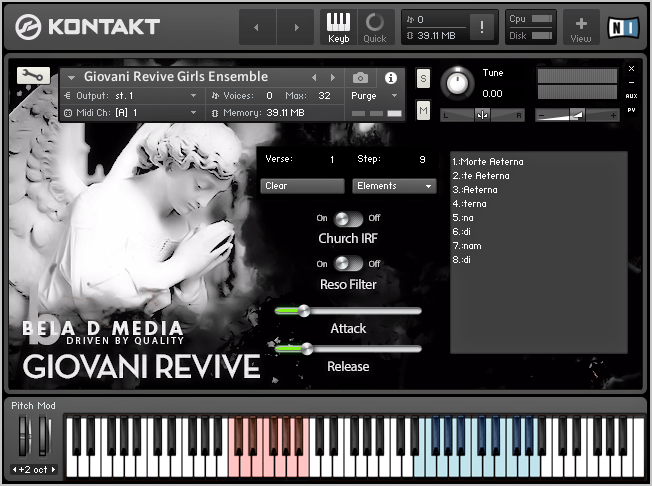 The Giovani Edition has been updated with carefully re-mastered audio, finer vocal turnings and the utilization of advanced Kontakt scripting. Now for the best news: The original Giovani Edition double DVD set sold retail for $400.00. The price has been dramatically reduced from the original and the cost to obtain this updated, more advanced version is unbeatable! The Giovani Choir is made up of very talented boys and girls from age 8 through 12 with an interest in performing challenging music at the highest level. The children won first prize at the Star Music Festival National Choral Competition and has toured throughout the USA and England. They also sang as invited guests of the Alliance for Arts and Understanding at the World Festival of Singing in the Czech Republic, performing in Dvorak Hall in Prague, St. Stephen’s Church, Prague and at churches in Hradec Kralove.